With a good cleanser, it’s important to feel squeaky clean after use, but not completely stripped of your natural oils. 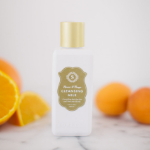 That’s why we love the Orange You Jelly Cleanser, which removes surface debris on the skin without leaving it dehydrated. 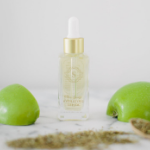 Key ingredients include turmeric, known for its anti-inflammatory benefits, and orange blossom water, which aids in reducing redness. 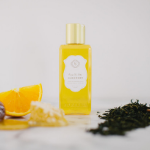 As the name implies, Sorella’s Apricot Mango Cleansing Milk is formulated with apricot oil and mango extract. It contains vitamins C, E, and B5 for a quenching boost of antioxidants. Perfect for dry, mature, and sensitive skin types, the cleanser has a creaminess that will leave the skin feeling revitalized and brightened. Who doesn’t want to diminish the signs of stress and fatigue? With its powerful 20% blend of vitamins A, C, and E, the Pomegranate Acai Antioxidant Serum is our pick for clients with dull skin or rosaccea. 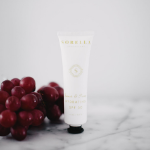 Natural ingredients like pomegranate extract, acai berry extract, tomato, and licorice root work together to protect the skin and improve overall tone. The Main Squeeze Hydrating Serum provides hydration that’s suitable for all skin types. Formulated with snow mushroom extract, this magic ingredient delivers deeper into the skin than hyaluronic acid. The product’s advanced delivery system also provides long term moisturize without clogging pores. With any moisturizer, it’s essential that the ingredients provide deep hydration. The Blueberry Milk Moisturizer not only enriches the epidermis with a hydrating formula, but it also provides much needed cellular repair. The product includes a high quality type of vitamin C that promotes brightness while minimizing signs of aging. 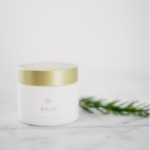 The Balm is aptly named given its balm-like consistency. For an overnight skin renewal, this moisturizer works to decrease the appearance of wrinkles and tighten the skin. Argireline inhibits new lines to form while the remaining blend of aloe vera, hyaluronic acid, vitamins and antioxidants helps fight free radicals. Finding a good SPF that not only layers well with other products, but also provides a nice coverage that doesn’t leave a white cast on the skin is a feat in and of itself. We’ve found our holy grail SPF that accomplishes such a goal. Quench & Protect Hydrating SPF 30 protects the skin from UVA/UVB rays and also functions as a great moisturizing base for makeup. 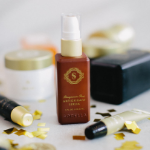 If your at-home care is missing a key product or you need a complete regime revamp, we’re here to help you decide on the right products to incorporate in your morning and nightly routine. Visit us at The Village Spa, located in the Village of Westclay in Carmel to get your skin in shape. Call us at (317) 853-6350 or book online now. All photos used in this blog post are attributed to @gagewoodphoto.